By default, user can only access forms via the List View, when working with items of the list - creating New items, editing or looking at the existing. But the forms for the list are actually stored in Site Pages -> Plumsail Forms folder. It's also possible to use these pages, or at least New Forms, without going into List View. Edit and Display Form require you to select an item manually in the List. 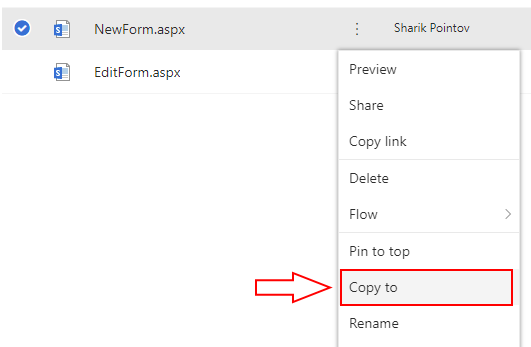 Let's say you want to move the page, so the SharePoint users don't have to go to List View and click Add new item. You can freely open and work in New Forms, they do not require any parameters, so it's possible to just open them here and start creating New items. By default, submitting the New Form will always redirect you to the List View of this form, but you can change it. Find out how to do it here.